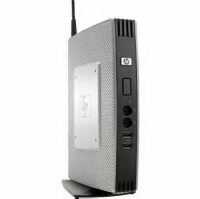 The HP t5740e Thin Client combines the Intel Atom processor and GL40 chipset, DDR3 RAM, and native dual-monitor support with VGA and DisplayPort connectors for impressive performance. HP boosts the user experience even further with comprehensive multimedia and USB redirection support, including HP RDP Enhance- ments and Citrix SpeedScreen technology, and support for HP Remote Graphics Software,. The low-power HP t5740e meets stringent ENERGY STAR requirements and complies with the EU's EuP Directive. Questions about the HP t5740e Thin Client? We can help. For more information about the HP t5740e Thin Client, or any of our products and services, call us at 1.800.457.8499 or email us. 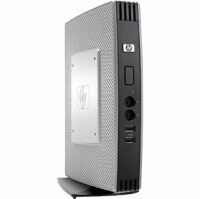 Order your HP t5740e Thin Client today. Order your HP t5740e Thin Client now. Your purchase order, with credit approval, is welcome, as well as all major credit cards, PayPal and Google Checkout. Remember, you'll get FREE technical service with every product you buy from Vecmar.